The Geography of Fernando de Noronha. Noronha islands seem to magically appear as giant lily pads floating in a turquoise pond called the Atlantic Ocean. Yet they are part of a greater geographic formation formed millions of years ago. The Fernando de Noronha islands are the peaks of an underwater volcanic mountain range. These mountains are 345 miles from Cabo San Roque and 545 km(338,6 miles) from Recife. There are a total of 21 pieces of land consisting of islands, rocks and islets. The largest island, considered the main land is 18 sq. km or 7.1 sq. miles. It is 10 km or 6.2 miles long and 3.5 km or 2.2 miles wide. The bottom of these volcanic mountains is 756 meters or 4,000 feet under the water. The main islands comprise 91% of the total surface area of the archipelago. 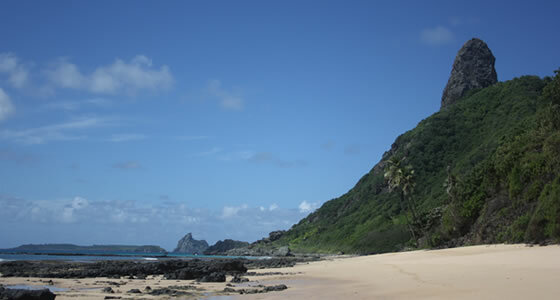 The main island is called Fernando de Noronha. The upper portion of this mainland is called Quixaba. The smaller islands are named Rata, Sela Gineta, Cabeluda and Sao Jose. The islets are called Leao and Viuva. These islands were formed two to 12 million years ago. The land is composed mostly of bushes and vines and a few trees. The most common shrubs are the bean Capparis and donkey milk Sapium. The donkey milk actually makes a sap that can burn human skin. The common herbs include jitiranas Opomea and Merremia. There are also several fruit trees on the islands including guava, banana, papaya, tamarind, cashew, soursop and mombin. Non indigenous species that have been introduced to the area include the coconut palm, eucalyptus and mango. There is a very rich avian life on these islands with some of the largest breeding colonies established here. Some of the migrating birds include the black noddy, sooty tern, red-footed booby, and frigatebird. There is also a large turtle breeding beach where female turtles come lay their eggs.There are a few natural reptiles and insects but no real mammals. Dolphins live in the waters around the island and are a major tourist attraction.